At one point early in my CIA career, I worked in a position similar to that of the job held by Dave Reed, the protagonist in Modify Destiny. I became inspired to write Modify Destiny while working in the CIA's message processing office. I retired early after working twenty-seven years for the CIA and seven years for the Hewlett-Packard Company. What if you discovered that people were disappearing at an alarming rate? What if those mysterious lights in the sky had something to do with the disappearances? What if the world as you knew it could change in a blink of an eye, a past totally wiped out and re-written? What if you really didn’t have any control over anything in your life? David (Dave) Reed works for the CIA. He works for the Message Watch Office, monitoring emails that arrive, making sure nothing unusual pops up. He’s also been studying to get his Master’s degree in world history, in the hopes of improving his career options. Dave believes he has his life and career all planned out. But he has this insatiable fascination with UFOs, an interest that has consciously and subconsciously marked his life since a mysterious encounter while serving at the Hummel Airforce Base in Alaska. Recent UFO activity in the small town of Ramps, Virginia, sparks his interest and a weekend camping trip with a co-worker, who’s also interested in UFOs, takes a different direction when the two decide to make Ramps their camping destination. And even their destination of Ramps becomes another anomaly in an already unusual plot. Bill Higgins’ science fiction novel, Modify Destiny, is full of unexpected and unusual twists and turns. There is something very top secret about these UFOs and only the highest level of command with the highest level of security knows the full truth. As the plot thickens, the reader wonders if this ‘very top secret’ knowledge will, at some point, be revealed. At first glance, the novel is another UFO mystery. But deeper into the plot there is a multitude of characters and interactions that create the illusion of a real life scenario, one that someone involves the assassinated President Kennedy. And where will this mystery lead? This is a fast-action page-turner, with a very believable plot and personable characters. It will certainly make readers want to question the many what if’s of life and what really is the truth. Modify Destiny is a science fiction novel written by Bill Higgins. Dave Reed's night shift job at the Message Watch Office of the CIA was fairly humdrum, that is, when he was not struggling to stay awake. He was working nights while attending George Mason University by day, and trying to be sure to ace all his classes. His co-worker, Maryanne, had no problem covering for him during his impromptu naps, but she did worry that their supervisor, Larson, would have something to say if he ever caught Dave snoozing. It was on one of those quiet, endless nights that Larson decided he needed real food instead of the stuff that came out of the Company's vending machines, and sent Dave and Maryanne out for steak and cheese subs. While they were driving, Dave fiddled with Maryanne's radio and tuned into a late night talk show on the paranormal. A woman caller was describing her husband's encounter with a UFO and subsequent hospitalization for radiation burns. Maryanne wondered about the woman's story, but Dave scoffed at her suppositions. Still, he began researching UFO sightings online when he got home after work. There was still that sighting he and others saw while stationed in Alaska lurking in the back of his mind: the event he had sworn to never talk about. 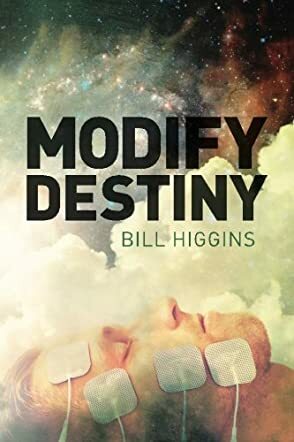 Bill Higgins' science fiction novel, Modify Destiny, is a treat to read if you've ever wondered about UFOs or harbored a secret longing to visit Area 51. I loved trailing along with Dave and his co-worker, Bob, as they take an overnight trip to Ramps, West Virginia, an active site of a number of sightings and more than a few unexplained disappearances, and the home of Tater Potts, a rustic original and Dave's internet correspondent. Modify Destiny has a credible and inventive plot, and it reads like a dream. Higgins brings dimension and history into the tale by setting the opening during President John F. Kennedy's term in office, and it works quite well to set the tone for his storyline. Modify Destiny is fun, fast-paced and filled with conspiracies, Grays and flashing lights in the sky. It's highly recommended. Modify Destiny is a science fiction thriller, but also it is the story of Dave Reed, a normal guy just going camping with his new friend, Bob Wang. Dave is looking forward to a couple of days of rest and relaxation after a busy time studying for school and working at the Message Watch Office of the CIA. He has always been interested in UFOs and there has been a rash of them in a small West Virginia town named Ramps where Tater Potts, a man he has read about, claims to have seen a bunch of these UFOs. He calls Tater and they agree to meet. Dave and Bob arrive in Ramps and head to the local restaurant to meet Tater, who is joined by his sister, Shelby. As they sit discussing the recent sightings, Dave and Shelby form an immediate attraction towards each other and go off to explore some cows that have died an unusual death. Tater and Bob go in another direction and they all plan to meet up later in the day. Tater invites the men to sleep over rather than having to camp out, and they gladly accept. To tell you more would really ruin the story and I don’t want to be guilty of that. I am not always a big fan of UFO stories because they are usually too technical and 'out there' for me to enjoy, however, Modify Destiny had me glued to my lounge chair and I anxiously kept reading. Bill Higgins has written a perfect blend of science fiction and real life to put this book on the five star level. I highly recommend it to both sci-fi and fiction fans alike – you will definitely not be disappointed. All I will tell you is that you will never ever see the end coming.